Everything you need to know about creating an adventure you can learn from Dora the Explorer. I know, you think I must be jesting. But I am not. Well maybe I do jest, a little. But have you ever watched an episode of Dora? My wife recently picked up about a dozen Dora videos on the cheap from a neighborhood rummage sale, and they have pretty much been played non-stop since then. My daughter, an earthbound angel, loves Dora the Explorer. I dig this because Dora is far easier to run in a continuous loop than Barney or Elmo. Besides the fact that Dora is better on the nerves and slows the progression of child show induced insanity, Dora the Explorer is also a great example of simple adventure building. They always start with some story (the background) to get you interested about a subject. They then place that subject in need of help (the hook). Dora must then overcome three obstacles (the encounters). Finally Dora saves the day and everyone rejoices (the reward). My daughter is only two right now, but if her interest in Dora doesn’t crumble in the next couple of years, I plan on using Dora as the formula to pique her interest in storytelling games. It will begin with our own collaborative adventure stories and hopefully if she still seems interested, it can progress to board games and finally table top role playing games. It is a good thing my wife is a non-gaming girly girl. That way she can ensure our daughter receives tutelage in finer social etiquette. Sometimes I fear I may be over zealous in my plot to corrupt my daughter into a gamer. I don’t want to push her into the introverted dork territory! Listening to: The Troll – Dora – I’m A Troll! Perfect intelligent item: The Map. Whenever the PCs need to refer to it, it constantly sings “I’m the map. I’m the map. I’m the map. I’m the map. I’m the map. I’m the map. I’m the map. I’m the MAP.” ad nauseum until they close it. 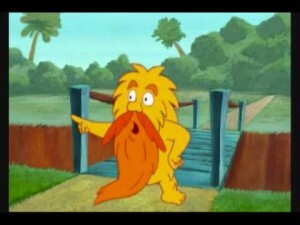 The GRUMPY OLD TROLL is a RPG icon … my kids love that guy. My 1-year old is obsessed with The Backyardigans and Batman (original Animated series – not the new “The Batman” crap). So when she’s a few years older, I’ll be setting up adventures that involve Tyrone the mailman having to fed off the Joker with an occasional musical interlude. @reveal74: Yes, and a Backpack that eats their equipment and says Delicious in Abysal! @Jonathan: Swiper the Fox is the favorite at my house, my daughter holds out her hand and tells me, “Daddy, no swiping!” when I am going to take something away from her. You know, I will never look @ Dora again in the same light. With both parents in our home playing RPGs, my daughter constantly wants to play. Now I have a way of writing adventures for her that we can play together. Thanks for posting this thought! @Tim Hely: My daughter recently discovered my comic book animated collectionm, which includes Hellboy, and she seemed to take to it. I’d love to use the HB verse as her playground for gaming. @Czar: I think all gamer parents have this desire to share their passion for gaming with their children. @Terry: I am glad to hear my post has given some inspiration, especially if it gets children involved.